Dr. Joseph Pohl is a board certified Obstetrician Gynecologist with 30 years experience in healthcare. He has an undergraduate degree in Chemistry / Business from the University of Richmond, Richmond, Virginia and attended medical school at the Virginia Commonwealth University School of Medicine, Richmond Virginia. Dr. Pohl interned at Letterman Army Medical Center in San Francisco, California and completed his residency at Madigan Army Regional Medical Center in Tacoma, Washington. Fellowship trained in Pelvic Reconstructive Surgery at Emory University, Atlanta, Georgia. 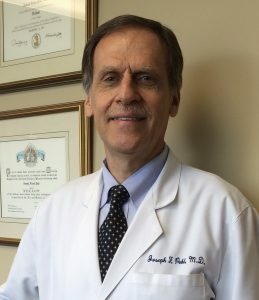 Staff Physician at Landstuhl Army Regional Medical Center in Germany, and completed his 12-year military service as a Lieutenant Colonel and Director of Pelvic Reconstructive Surgery and Urogynecology at Walter Reed Army Medical Center, Bethesda National Naval Medical Center, Uniformed Services University of Health Sciences in Washington, DC. Dr. Pohl’s current interests are exercise and fitness, food and nutrition, and how lifestyle changes impact wellness and chronic disease prevention.